The Digital Revolution has affected us all. It has changed the way we do business, the way we entertain ourselves, even the way we interact with one another. I remember in my first editing job having to mark up manuscripts with a pencil and type on an IBM Selectric. Not only that, but I had to page through dictionaries and atlases to proofread and fact check. Can you imagine? These days I would be lost without my computer and research tools like Google and Wikipedia that make a world of information available in fractions of a second. Of course, there remain those who resist technology. (“I don’t do computers,” I hear them say.) It is almost a point of pride that they have closed their minds to modern methods and learning new skills. But I’m afraid that they are destined to be left in the dust and will find that they are missing out on a lot. I’ll admit that with the advent of the Internet, there were some skeptics and holdouts in our offices. Will this last? Is it worth dedicating time and resources to? Eventually we realized that resistance was futile, and we built one of the most popular wingshooting sites on the web. Once on the electronic bandwagon, we strove to remain at the forefront of digital development. This led to our next project: Sporting Shot. This “e-zine” was completely electronic and published on alternate months from Shooting Sportsman. It contained the same types of stories as SSM, but the content was unique—not having appeared in the print magazine. It had slideshows, embedded video, hotlinks to websites and more. And it was free. Understandably, Sporting Shot was popular with viewers as well as advertisers and developed a strong following. But the Internet, by its nature, is continually changing, and after a few years of publishing Sporting Shot, we decided that it was better to remain in more frequent contact with readers. The result was that we folded Sporting Shot and launched Shooting Sportsman Insider, an electronic newsletter that was—and is—delivered to a large list of subscribers every two weeks. Each Insider typically contains three short articles, and often there will be a video and links to more information. You can go to www.shootingsportsman.com right now and sign up to receive it. Free, of course. We also have created a Facebook page, which we update frequently with industry news, photos, videos and information about Shooting Sportsman. If you haven’t yet, I encourage you to visit our page and “like” it. It’s just one more way to keep in touch with the world of wingshooting & fine guns. And to bring things full circle, we recently redesigned our website. This was Associate Editor Ed Carroll’s pet project, and I think you’ll agree he’s done a great job. The site now contains much more editorial content, some great videos, a growing photo gallery, our active bulletin board and more. As a way to celebrate the “new” site, we are launching “The Load Up on Rio Contest.” In conjunction with Rio Ammunition, each month we will be posting a short wingshooting quiz on the site, and anyone who takes it will be eligible to win Rio shotshells. With a different quiz, prize and winner every month, we think this is a great way to not only have fun, but possibly fill the ammo chest with quality shells. Good luck! 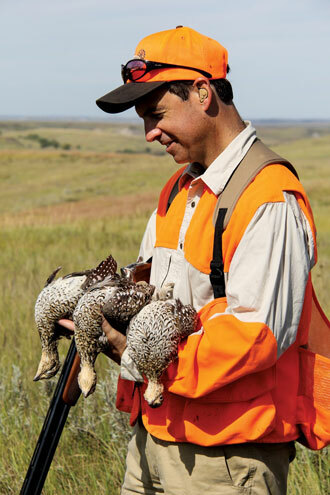 Get “The Upland Issue” now, in print or online, with a subscription to Shooting Sportsman, the Magazine of Wingshooting & Fine Guns. Which spot in the vast North Woods would give me an exemplary feel for both the hunting and the hunters? The answer came from Minnesota photographer Lee Kjos, who during a phone conversation mentioned Little Moran and its proprietor, Steve Grossman.